Mats Malmer excavating the Eastern Trench at Alvastra pile dwelling. Photo: Stockholm University. 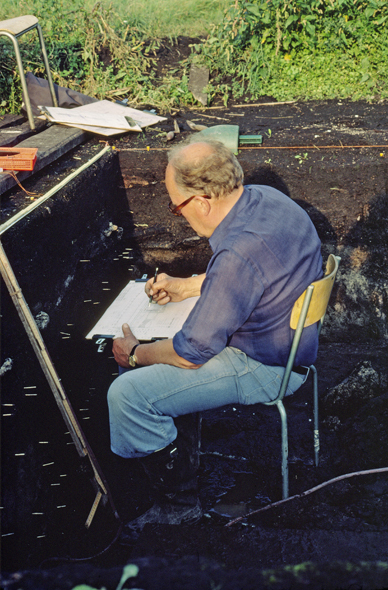 Mats Malmer directed the excavations at the pile dwelling in 1976-1980. At the time he was professor of archaeology at the University of Stockholm but he came from the University of Lund where he was professor from 1970 to 1973. He became a PhD at the University of Lund in 1962.Mats Malmer’s wife, Brita Malmer, was a numismatist and director of the Royal Coin Cabinet in Stockholm from 1971 to 1979. She also became a PhD at the University of Lund in 1966. For this reason it is logical that the personal archives of Mats and Brita Malmer were given to the University Library of Lund after the death of Brita Malmer in 2013. The Alvastra project recently made a journey to Lund to take part in a network meeting for Stone Age archaeologists employed at the Archaeologists of the National Historical Museums. I took the opportunity to go through the Mats and Brita Malmer archives to see if there was any material that was of interest for the Alvastra pile dwelling project. The material was donated to the Lund University Library by the historian Elin Malmer, daughter of Brita and Mats Malmer. It has not been completely systematized yet but a heading in section 24.4 of the list of archive contents caught my attention: Slides: Stone Age Alvastra. However, the slides stored here were similar to the ones already available in the Alvastra pile dwelling archives housed for the moment at the Swedish History Museum. Unfortunately sections 16 – 20 correspondence had not yet been systematized and was thus not available for study. Other material in these archives includes preparatory material from Mats Malmer’s various publications, notes and photographs from journeys undertaken, lecture manuscripts, material from Mats Malmer’s school education and personal material such as birthday cards, wedding invitations and the like. Elin Malmer donated material that had direct relevance for the pile dwelling to the Swedish History Museum and this is also in the process of being systematized by Erica Nyström, archivist of the Swedish History Museum. Part of these archives will be made accessible on the digital platform that is being set up within the Alvastra pile dwelling project.